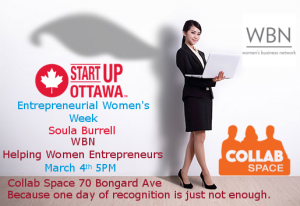 Come and meet Soula and learn what belonging to the WBN is all about. It’s a great time to be a Woman in Business and to be a part of a strong and supportive networking group. The WBN’s core purpose is to support the business success of Canadian women and everything we do reflects that intent. We strive to provide programming that helps our members and guests take steps to achieve their goals and find their version of success. We facilitate meaningful approaches to networking, embrace new ways of enriching our connections and raising awareness of our members. We embrace businesswomen of all ages, cultures, industries and professions. We are mentors, sharing experiences, challenges and wisdom, collaborating within the network, and ultimately the greater business community. Our Mission: We are committed to empowering Canadian businesswomen to achieve success on their own terms. We strive to provide opportunities for women to connect with and support each other. We deliver programs that contribute to the personal and professional development of our members, meeting their needs at the right time in the right way. Our Vision: We shape the future of businesswomen in Canada by providing opportunities for development, fostering valuable connections, and facilitating member success through business and career growth. •We recognize and promote one another. •We pursue growth and learning. The Women’s Business Network has been providing networking opportunities for over 35 years and continues to evolve and embrace today’s women in business. A forward-thinking, inspiring organization, the WBN supports and celebrates the growth and success of all members.